Paper HeARTIST: May's Stamp of the Month..."You've Got a Friend"
May's Stamp of the Month..."You've Got a Friend"
With over 50 participants, you are surely to find wonderful inspiration through this blog hop. It makes a circle so if you are starting here just continue until you make your way back and you will have made it through them all. If you have already started and are coming from Traci Godbee's blog, "Create with Traci", then you are on the right track. 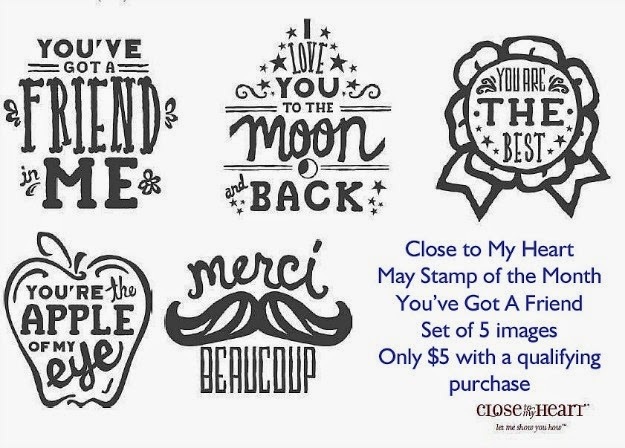 Pick up your own Stamp of the Month for only $17.95 OR this month only you can get it for FREE with a $50 purchase! Be sure to contact your Close To My Heart Independent Consultant to get yours. If you don't already have a consultant, I'd love to be yours. You can find details on the "Stamp of the Month" by clicking on the "Promotions" tab at the top of the page or purchase your SOTM here. Of course, if you have any questions, please don't hesitate to contact me. If you have time, take a moment or two to check out the rest of my blog. If you enjoy your visit, then please consider "Following Me", signing up to receive blog updates, and/or leaving a comment (we all love comments...the nice ones anyway), then be sure to continue along on the hop by heading over to my fellow consultant, Vicki Price's blog, "Price of Paper" and check out her project.